My recent visit to Hosahalli not only took me many years into our past but also served to re-enthuse me. I have always considered Hosahalli to be my ‘charging station’ and i feel inspired after each visit. Apart from my feelings about the dairy that I have already written about, I remembered another special person who was a source of great support and strength in our early days. Kumar was showing me around all the new modifications he had made to the buildings and I was wondering how things had changed. It was 23 years ago, in 1989, that we completed the first two rooms of our Tribal school. When we first got support for this construction from DANIDA (through Ms. Padmasini Asuri, the then adviser of DANIDA, stationed at Bangalore) and from the LOTUS Trust of Mumbai (on the recommendation of Justice D.M.Chandrashekar), I was unsure how to proceed. Swami Sureshananda asked me to request Chandra Shetty, an engineer and a devotee of the Ramakrishna Ashrama who had retired from active engineering responsibilities, for help and guidance. He not only wholeheartedly agreed but continued to support to us till his death. He must have been around 65-70 years when I first met him. With scant regard for his personal health and convenience, he would accompany me each time he was required to oversee the construction work we were undertaking. Whether it was the school construction at Hosahalli or the hospital at Kenchanahalli, he was always there for us. 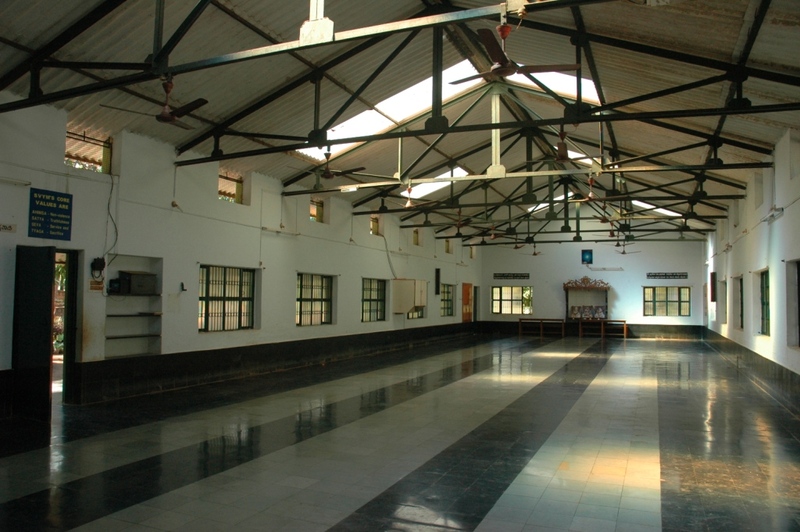 In fact the old school building (which is now the D.Ed college and hostel), the dining hall, the boys hostel, the teachers’ quarters and the kuteera in which I lived for several years in our old campus at Hosahalli were all designed by him. He would draw simple sketches on pieces of paper and give them to me and they would be our blueprints. He was the one who first suggested that we use mud mortar in our construction. His logic was quite simple. Cement was expensive and construction with cement required a lot of water for curing. Moreover, he saw no major structural advantage for cement over the good red soil that we could source locally. He was very practical too. He said the soil mortar could be well covered by cement plastering and that was that. The dining hall was built only with red soil. Many visitors who came when it was under construction commented that it would not even last 5 years. I was worried and anxious that I could possibly be wasting valuable public resources. Sometimes not knowing too much is also a blessing in disguise! Chandra Shetty reassured me that buildings built out of soil and lime mortar have stood the test of time and some of them are centuries old. Having implicit faith in him, I decided to go by his advice and guidance. As I walked around the dining hall 23 years later, I felt thankful to Chandra Shetty. All my knowledge of building materials, construction, and practical nuances of workmanship came from this extraordinary person who was deeply committed to what we were doing. It was people like him whose faith in us and our vision that helped sustain and grow SVYM into what it is today.